I have been in the United States now for almost 3 months. I started off at in the University of Pennsylvania for seven weeks. It’s an Ivy League university, so it was an absolute privilege to be living in the actual campus and getting the feel of it all. My contract there with the Julian Krinsky programs opened up a huge platform for networking. I got the opportunity to meet people from all over the world. The opportunities this county offers is overwhelming. Their positivity and their drive for excellence are amazing. There are no limitations to their ideas and goals. They also place a huge importance on their education system. The academic programs that the children are exposed to are crazy. Teenagers are sent to these Ivy League universities to do internships for five weeks during the summer holidays. It’s a great way to expose them to the industry that they are looking to do their degree in. After my time in Philadelphia, I made my way to Florida -where I am at the moment. This was my main reason for my trip. The hub of tennis and it truly is!!!!! It’s truly the best thing I could have ever done for my career. 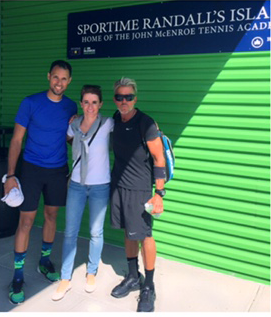 I have been visiting top tennis academies in Florida such as Saddlebrook, Evert, USTA National campus, Inspiration, McEnroe and Johan Kriek. At these academies, I have been privileged to sit in on their tennis and, most importantly, their conditioning programs for a couple of days. Chris Emkey, who partners the legendary Pat Etcheberry. Satoshi Ochi, Head Strength and Conditioning Coach at the USTA. Satoshi works closely with Jezz Green (Andy Murray’s former strength trainer) and currently trains Alexander Zverev. Chris May, John Isner’s strength trainer. Franco Herrero, the strength and conditioning director of Evert Tennis Academy. I have had the privilege of shadowing them; discussing and sharing many issues, concerns and questions (things that I have been wanting to discuss for so many years with an experienced tennis specific trainer). The exposure that I have experienced with these different trainers has provided the validation in my method of training. It has been the highest turning point and satisfaction in my career thus far. The other massive highlight of my trip has been my exposure to pro-level training. It has been a dream come true as a trainer. The US Open is starting next week, so my timing in Florida was perfect. I managed to see players such as John Isner and a handful of male and female players ranked from 30 -100 in the world, in training. I also got to see the Top 10 Juniors in the world prep for the Junior Open. I am blown away from everything I have encountered so far. 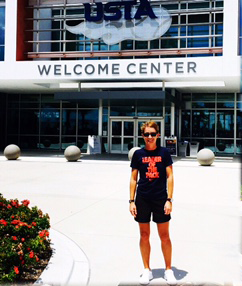 The infrastructure and facilities are incredible. The amount of financial support they pump into player development for college purposes is also unbelievable. All in all, my trip has already exceeded my expectations. The exposure and contacts I have made and the information I have gathered is priceless. Heading to my first Grand Slam next week so I’m in total excitement.